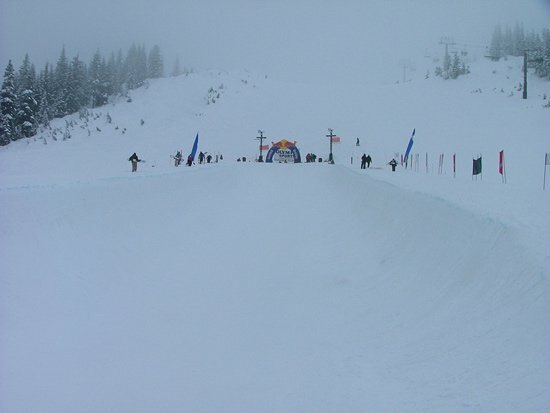 The second halfpipe competition in the Pacific Northwest took place this past Saturday at Snoqualmie Pass, thirty miles east of Seattle. 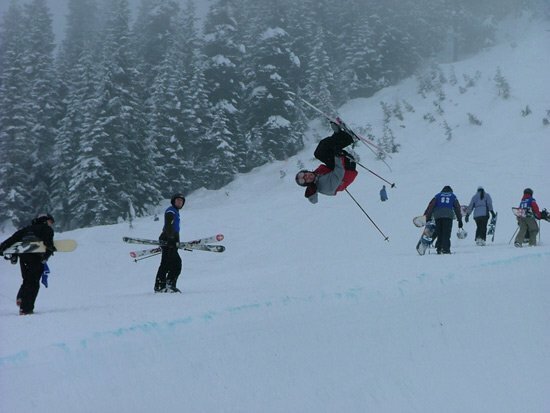 In typical Northwest fashion, new snow made the pipe conditions difficult. Though near-perfect the day before, four inches of new snow the night prior to the comp filled in the flats. With a small delay for grooming, the terrain park staff did a great job getting the superpipe in the best condition possible under the circumstances. The competition was a jam format, with each rider getting in as many runs as possible within a one-hour time limit. After the delays for pipe maintenance, over an hour of practice, and the snowboard jam, the skiersâ€™ jam began just a little before 1:00pm. For the first time that day, the sun managed to find its way through the fog to give some nice lighting for most of the comp. It was clear from the beginning it was going to be a difficult contest. While numerous skiers were busting huge airs and impressive tricks, none of the best skiers good put together a solid run for the first half of the jam. Chris Eggleston held the lead for the beginning of the contest with a stomped 720 at the bottom of his run. However, when Zach Davison finally stuck a run including inverts on both walls and a 540, he took the lead and never give it back. Eggleston managed to put together another solid run including a 540 up top and a 720 at the bottom, but it was only good enough for second place. Third place went to Luke Amundson, who linked together some of the largest straight airs and alley-oops of the day. A special shout-out goes to Jeff Thomas, who was going by far the biggest of the day, but decked out repeatedly on his flairs on the second hit of his run. On the female side of things, Brooke Larsen took her second victory, edging out Amy McDermid by mixing up her grabs and some nice alley-oops. Not only did Snoqualmie do a great job dealing with the difficult weather, but also did a great job with the awards. Numerous sponsors donated a ton of prizes for the competitors. Two pairs of K2 Fujatives, tons of Smith goggles, and quite a bit more schwag were up for grabs. Davison walked away with a pair of Fujatives, $250, and some Smith goggles. "It happened so fast. I didn't even have time to react before I was flying down the pipe"